South Gloucestershire aims to promote the principles of support and aspiration for every child with special educational needs and/or a disability (SEND). The 0-25 service works extensively with parents/carers, educational settings and other professionals to ensure that person centred planning is our guiding principle and that children and their families are supported to remain part of their own local communities, have their needs met within the community and they feel valued and supported. The vast majority of children, young people with SEND will have their needs met by the resources already available in educational and training settings (early years settings, schools, colleges, apprenticeships, and internships). In order to meet the threshold for starting an education, health and care (EHC) needs assessment the child or young person must have special educational needs or a disability that significantly impacts on their ability to access education. Statutory Process for Education Health and Care Needs Assessment (EHCna) and Plan (EHCplan) Pathway. Guidance on education, health and care needs assessment and plan process. Our Access and Response Teams (ART) gather information about your concerns before assessing each case and determining the next appropriate steps to support children and families. The teams are made up of a range of staff who can also provide advice to professionals regarding completion of a ‘single assessment form’. 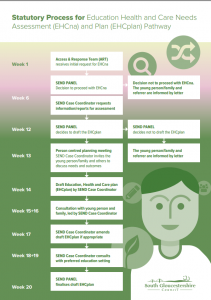 A child’s journey of need document provides guidance for professionals who are working with children, young people and families. Helping to identify when a child may need additional support to achieve their potential. Children’s needs are not static, they may experience different needs at different points throughout their childhood years. The ‘Local First’ Framework is in place across four local authorities in the West of England, including South Gloucestershire Council. For Year 11 (and above) transitions to high needs post-16/ further education provision, it requires all local possibilities of provision to be explored before out-of-county provision is considered.